Bitcoin futures trading will play a key role in pushing the price of the cryptocurrency as high as $50,000 next year. Further big rises in the price of Bitcoin – currently trading at around $17,000 – may seem far-fetched given the 1,700% increase it's had in 2017. But while another 1,700% gain in one year would be a stretch, the Bitcoin price should have enough of a tailwind to triple or even quadruple in 2018. A lot of that tailwind will result from Bitcoin futures trading, both directly and indirectly. "I think that Bitcoin being listed on two reputable exchanges gives a great deal of reputation to the product itself and I think as a result it will become even more popular than it's been before," Interactive Brokers Chair Thomas Peterffy told CNBC Monday. Futures trading has already had a major impact on the price of Bitcoin. 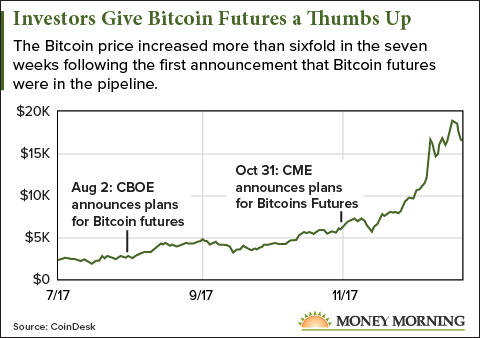 The first serious rumblings that Bitcoin futures were on the way came during the summer. CBOE announced its intent to trade Bitcoin derivatives in August. At the time, the price of Bitcoin was hovering around $2,700. That was certainly a factor in helping push the Bitcoin price higher in August and September. But the real trigger came Oct. 31, when CME, the world's largest futures exchange (it has three times the trading volume of CBOE), announced its intention to launch Bitcoin futures trading. The price of Bitcoin rose more than 5% that day, from $6,122 to $6,447. And that was the start of a seven-week run, in which the Bitcoin price has tripled. What's interesting about this is that some Wall Street pundits predicted that futures trading would push the Bitcoin price down, since it would make it much easier for deep-pocketed players to short the cryptocurrency. Since Bitcoin futures trading began, the price has edged to new highs, rising as far as $19,783.21 on Dec. 17. So far, more Bitcoin futures traders are betting long than short – surprising for a commodity that many Wall Street leaders, including JPMorgan Chase & Co. (NYSE: JPM) CEO Jamie Dimon, consider a bubble. Today (Wednesday), Bitcoin futures contracts were trading $300 to $700 above the spot price on CBOE and $500 to $1,000 higher on CME. The difference of 1.6% to 5.56% is unusually large for short-term futures, which typically trade within 1% of the spot price of the underlying commodity. It suggests that investors were right in the months leading up to futures trading – it's a positive for the Bitcoin price. And it's just getting started. Volume has been thin in the early days, but it is expected to pick up in the weeks and months ahead as the market evolves. Many traders have been eagerly awaiting this opportunity. Institutional investors have been unable to trade Bitcoin in any form, because it's unregulated. Futures trading on the CBOE and CME changes that. "The demand for the asset remains highly elevated and the fact that you can now trade it on an exchange means it's open to a wider audience," Jordan Hiscott, chief trader at Ayondo Markets Ltd., told Express.co.uk. Free Stuff: Money Morning knows cryptocurrencies. We've been writing about them since 2011, far longer than most other news sites. To get 100% free, real-time alerts sent to your inbox, sign up here. 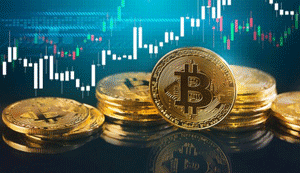 As the Bitcoin futures market matures, short trading should pick up, but it's hard to envision it outpacing those betting on the cryptocurrency's continuing rise. That will keep upward pressure on the price of Bitcoin through most of next year. But allowing heavyweights to take part in the Bitcoin market isn't the only reason futures trading will boost the Bitcoin price in 2018. Hi if I win big than send me some money. Looking forward to reading your book. May we both be blessed. Is there some way that I can invest $ 20,000?